A beautiful reminder of a friend remains atop our 10 foot Christmas tree this year. It has watched over our Christmas season each year since we got it. We moved into the neighborhood in 2003.... 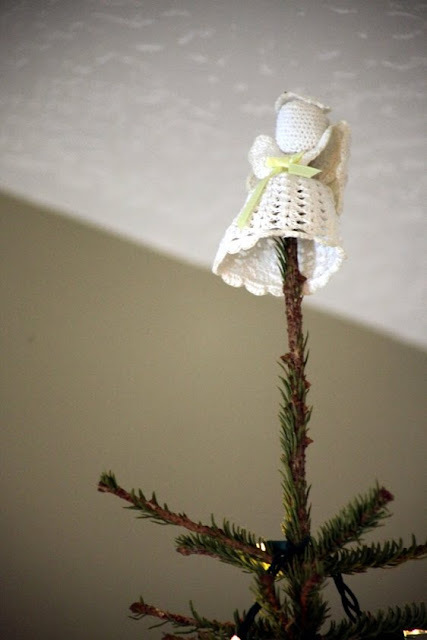 I was given this little crocheted angel from a sweet neighbor and friend named Mary Ann. She passed away this past Saturday...and I am still trying understand how quickly it all happened. I will miss glancing out my kitchen window and seeing Mary Ann scurry (faster than a woman her age should!) across the road to get her newspaper in her bathrobe, watching her tend her beautiful flowers, mow her own lawn (up until this past summer), and seeing the comforting light coming from her living room at night...part of our neighborhood has changed forever. I'll miss our dooryard conversations on my front lawn (this summer our chats required quite a bit of maintenance...i.e. I had to frequently pull Skagit away from her and chase down my toddler - I'm sure it was quite a comical sight to behold). Sometimes when she'd walk across the street to get her mail in the afternoon, I would be on my lawnmower. It was always a welcome break, climbing off the mower to talk with Mary Ann. When I took up knitting in October we had planned to get together after the holidays... She gave me a few knitting patterns she had from years ago, and I was excited to learn how to crochet at some point down the road (as if this current addiction isn't bad enough!). I went over to her house (unannounced) the Friday before last to show her Clarence (my newest knitting project)...and she took a long getting to the door (I was starting to worry). When she got there she said that we couldn't come in for a visit. Her soulful, wise, 80 year old eyes told me something was wrong... She had the flu and she didn't want to give it to us. I glanced behind her to her favorite chair and I noticed it was completely covered with blankets to keep her warm. She looked so frail to me with her walker....I wanted to scoop her up and take care of her, but you can't do that sort of thing. I asked and asked and asked her if there was anything I could do for her, feeling completely helpless. She said that her daughter Janet had gone to get a prescription for her, and that she would be fine. I ran across the street for her and got her mail for her...and left with a heavy heart. 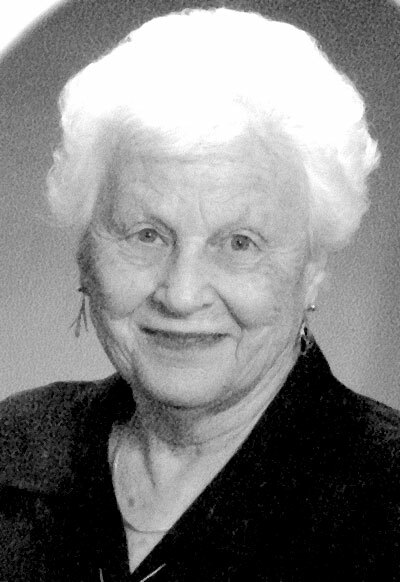 MISSOULA – Mary Ann “Marian” Johnson, age 80, of Missoula, died Saturday, Dec. 12, 2009, at St. Patrick Hospital. Marian was born May 25, 1929, in Bismarck, N.D., to parents, Barbara (Gress) and Peter Pfau. She grew up and attended schools in Stevensville, and also attended Sacred Heart Academy in Missoula. She married Ernest Ray Johnson on June 25, 1947, at St. Mary’s Mission in Stevensville. The couple moved to Missoula in 1956 and lived here most of their lives and built a home in 1959 in the Target Range area, where she was residing at the time of her death. Marian was a member of Pope John XXIII Catholic Church and St. Anthony’s Parish. She loved taking care of her family and home, and fishing with her parents and husband. Marian enjoyed crocheting angels and making caramels. She was preceded in death by her parents, husband, grandson, and great-grandson. She is now survived by her children; son Gordon (Val) Johnson of Hanson, Ky.; son Douglas (Rhonda) Johnson of Hamilton; and daughter Janet (Mike) Dean of Missoula; a brother Pete (Frances) Pfau of Victor; sister Margaret Drew of Dillon; eight grandchildren, nine great-grandchildren, and numerous extended family. Funeral Mass will be celebrated at 2 p.m. Wednesday, Dec. 16, at St. Anthony’s Catholic Church, with Rev. Gary Reller as celebrant. A reception will follow in the Church social Hall. Inurnment will take place at a later date. Arrangements are under the direction and care of Garden City Funeral Home and Crematory. A very nice tribute E!! Her family would probably love to see this! You are so sweet! God Bless Mary Ann! Thank you for writing this. She meant so, so much to all of us, and it is continually amazing to see how she touched those around her. We miss her very much, but we know that her legacy of love lives on. Wow. Such a sweet post. I come back to this post occasionally because it's such a great tribute to my beautiful gramma. I tear up everytime, and tonight was no exception. Hope you and your family are well.